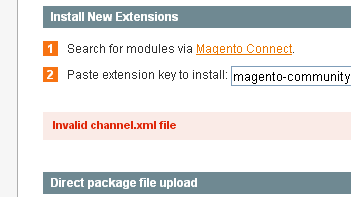 Invalid channel.xml file when trying to install a Magento Extension? Magento out of the box has a great feature set, however, there are times that you need to expand this, it could be extra shipping options or front end functionality for example. Magento connect is the original market place for extensions, there are literally thousands to choose from and most can be installed via the Magento connect feature. If you sign into the Magento connect marketplace and select and copy the install Key you can then install the extension. The key is just a URL the location of the zipped files and folders which Magento connect will download and install, once you hit the proceed button. Best practice as ever with extensions is to install extensions on non production environments and ensure you have a full backup of the site (files / folders / database) and the means to restore if needed. And if you want Magento Admin Training we offer UK wide on-site or online training. This can be one to one or group and fully bespoke to your needs. Please get in contact if you would like to know more.